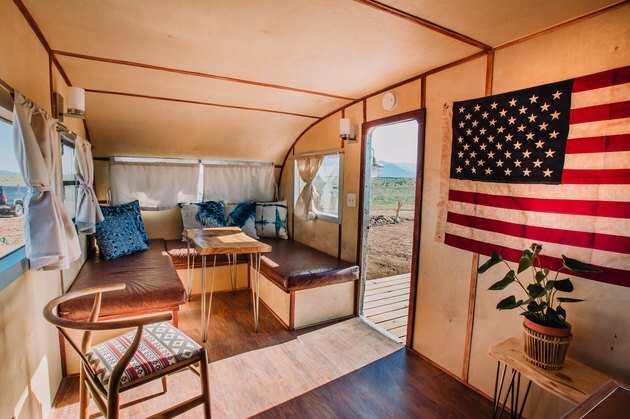 "Each has its own personality and story," says co-operating manager Patrick Nechvatal, about the antique and vintage trailers at Hotel Luna Mystica, eight miles from Taos, New Mexico. Instead of checking into hotel rooms, guests stay in these super-private accommodations on wheels, with 360-degree mountain views. Nechvatal and his crew retrofitted each to not only modernize countertops, beds and plumbing, they gave them a design overhaul. This took six months, including many trips to local resale shops in search of quirky, fun décor such as knick-knacks. Nechvatal and his mother teamed up to sew the café curtains in each trailer and camper. "The state of condition inside the trailers varies," says Nechvatal, about the revamping process. "It's a little like mining. You have to dig through a lot of junk. There's really a whole community obsessed with these campers and older trailer models." Tapping into those folks led to a web of connections. 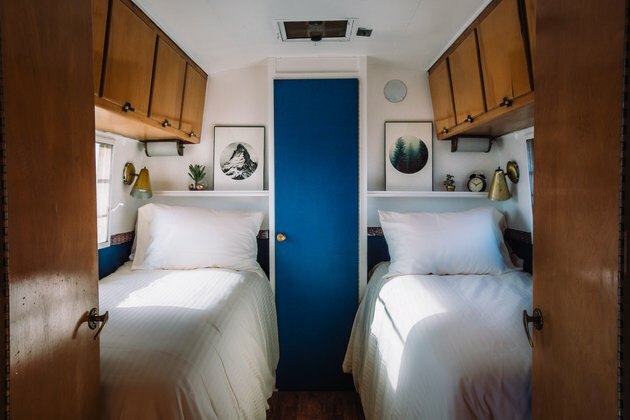 What is the process of decorating a camper like? "First thing that comes is the name," says Nechvatal. "Once we have the name, we sit on it for a little bit and get to know it. (The design) just kind of unravels after that." For example, "Jazzy" — a 1950 Spartan Imperial Manor named after a friend's dog — flaunts Southwestern décor with Mexican-blanket pillows and desert houseplants, while "Christopher" (a 1951 Royal Spartanette) is awash in patriotic colors and in honor of a local artist. "Rosie," a 1953 trailer, is inspired by the elephant of the same name in the 2006 novel (later made into a film) Water for Elephants by Sara Gruen. 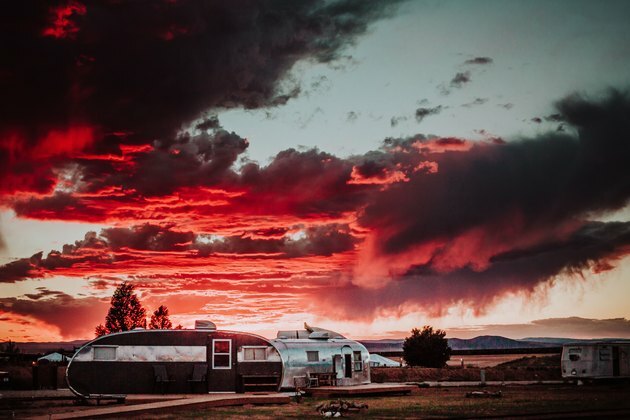 There's no communal area with walls — instead, a fire pit and hammocks are open to guests who want to enjoy the stunning vistas just outside of their trailers and campers. Blue-and-white batik pillows, an American flag hung on the wall as art, and stainless-steel surfaces were added to the 1951 Royal Spartanette, courtesy of local photographer Christopher Dahl Bredine. 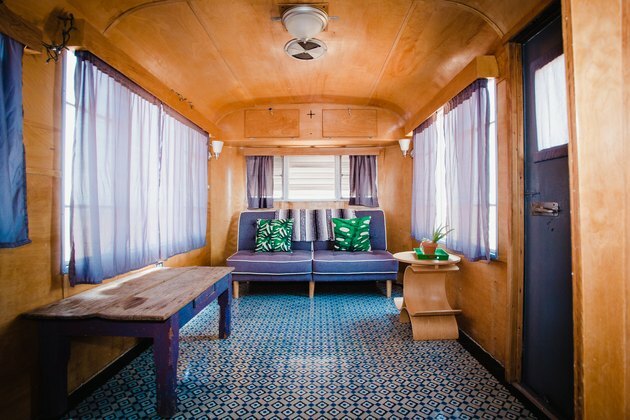 Jewel-tone furnishings evoke the Southwest in "Judd" (a 1953 Vagabond trailer with a turquoise exterior) when paired with a potted aloe plant, plus fern-motif throw pillows and a Mexican blanket. Channeling the nautical lifestyle with crisp white bed linens and marine-blue accent walls (and a door), "Thelma" (a 1963 Avion Tourist) is also decked out with nature-inspired knick-knacks and framed art. 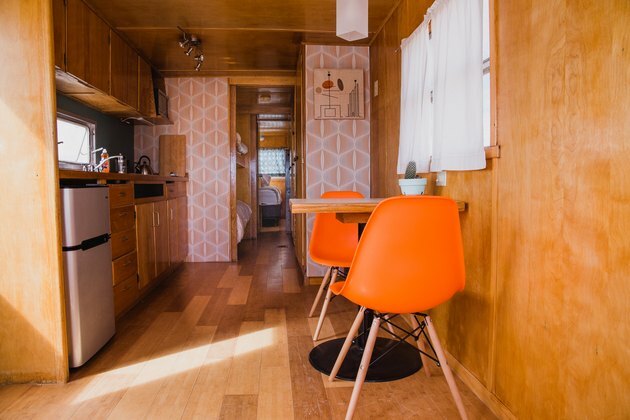 In the shell of a 1954 Spartan Imperial Mansion trailer is a midcentury modern vibe with a pair of orange molded fiberglass chairs, a petal-pink accent wall, and wood-paneling all around.